Bit of background info on the data and methods that I've used. 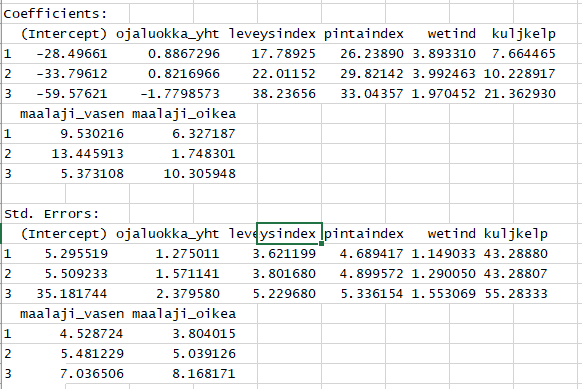 I have a forest road data that consists of one dependent variable which has 4 classes (0-3). The Dependent variable reflects possibility to use heavy log trucks on the road during different seasons: 0 = whole year around, 1 = summer and winter, 2 = dry summer and winter, 3 = only winter(frozen ground). In addition I have independent variables that reflect the condition of the road and thus affect the trafficability of the road during different seasons. Independent variables are such as: width of the road, wetness index, soil that the road has been built on, etc. As a whole there are seven independent variables. I have normalized the independent variables (even though it is not necessary in MLR) to range between 0 and 1 according to the goodness of the variable, for example soil: 0.1 gravel, 0.3 sand, 0.5 sandy moraine, 0.8 peat, 1 high amount of clay. Or do you have some other methods I could use beside from MLR. I think normal regression in this case is acceptable because independent variables have been changed to continuous values from categorical values. In that case it doesn't matter if result is a continuous value and not categorical. If you're asking for the regression coefficients related to the reference category: they don't exist. So, the probability of being in the reference category only has covariates related to being in the other 2 categories. Side note: you can ask R to graph the probabilities of being in all the categories of interest, technique detailed at this link by UCLA. With respect, this question doesn't make sense to me. In plain old multinomial regression, you can predict the probability of responding in each category given the covariates using the equations above - or you can ask R to do it for you as detailed in the link above, which is much easier. If this isn't what you were asking, can you clarify? This question would make sense in the context of latent class analysis and latent class regression, but you didn't ask about that technique. I think normal regression in this case is acceptable because independent variables have been changed to continuous values from categorical values. I assume you're talking about an extension of a linear probability model (LPM). In that model, you fit a linear model to a binary dependent variable. LPMs are outdated because we have logistic regression, but truth be told, they may not always be bad. After all, in linear regression, you're trying to estimate the mean of $Y$ given some a vector of covariates $X$. The mean of a $Y$ that takes on values 1 and 0 is going to be the probability of $Y$. In logistic regression, you're estimating $P(Y = 1)$ as the function of some $X$s. If you were to extend this to the multinomial case, though, I think that would be wrong. Your outcome is un-ordered categorical (or you're modeling it as such). If you fit a linear model, you'd be applying an assumption that it's ordered, for one. You'd also be assuming that the distance between 1 and 2 is the same as the distance between 2 and 3. That doesn't quite make sense, and I would guess that most reviewers would say this makes less sense than using an LPM on a binary outcome. I have normalized the independent variables (even though it is not necessary in MLR) to range between 0 and 1 according to the goodness of the variable, for example soil: 0.1 gravel, 0.3 sand, 0.5 sandy moraine, 0.8 peat, 1 high amount of clay. I'm not sure I'd recommend this. I'd treat soil type as categorical. You don't need to normalize the independent variables in any regression. How do I interpret logistic regression output for categorical variables when two categories are missing? Transform categorical variables for cluster analysis in R (mlr)? How to estimate the coefficients of different seasonal effects? How to work with unbalanced datasets in generalized Boosted Regression Models using gbm in r?